We apologize for these player reviews being so late into the offseason — Marquette played its last game nearly two months ago — but that pesky thing called the real world got in the way. That, and the coaching chance made us put these bad boys on the back burner. We’ll try and give you some good information while also linking back to the stellar work Anonymous Eagle did on its respective player reviews. We’ll have a dab of Synergy, a touch of KenPom and our own eye-test analysis to break down exactly what each player did well, where he struggled and how he can improve for next season. For the seniors, that final part will be replaced with where he’s headed post-Marquette. Paint Touches has been hesitant to use the hashtag through two seasons, fully understanding Taylor’s limitations as a defender and questionable shot selection that relegated him to the bench for the majority of his time as an underclassman. A nationally ranked recruit playing with Jabari Parker at Chicago’s Simeon Career Academy, Taylor was more raw than expected, and it seemed as though the speed of college basketball was a little too quick than what he had seen in high school. Then we spoke with him at Steve Wojciechowski’s introductory press conference. It was about as off the cuff and candid a college player could be with the local media, more or less admitting to a personal rift with Buzz Williams the previous year that, to him, inexplicably put him on the bench during games after completing a week’s worth of practices. You can read all of Taylor’s comments in the story linked below, and you should before reading the rest of his review. If you’ve completely extinguished the thought of the Marquette-Ohio State game from your mind, no one will blame you. The Golden Eagles scored 35 points, were blown out at home in front of a national audience and was the first of many games in which Williams’ group disappointed when expectations were high. If you’ve forgotten about we apologize for bringing it up again, but it’s important when considering Taylor’s performance this past season. In that game, Taylor grabbed nine rebounds in 16 minutes. He missed all three of his shots (including a 3-pointer) and didn’t log another statistic, but those nine rebounds led all players and made quite an impact. Most boards came above the rim, and though Ohio State was hardly a good offensive rebounding team this past season, it showed off Taylor’s elite athleticism for a player of his stature. And that was where Taylor made his mark in limited minutes. His 22.1 percent defensive rebounding rate led Marquette by a wide margin — he led the team in this category for a second season — and, though it came in far fewer minutes, was actually a higher rate than Jae Crowder’s mark as a senior two seasons ago (20.6 percent). Taylor told Paint Touches at Wojciechowski’s presser that he wants to “rebound everything,” and that’s what he’ll need to do next season. As it stands, Taylor is Marquette’s biggest player until Luke Fischer is eligible in the second semester. Taylor will be forced to play “center,” put in quotes because he’ll be closer to a Lazar Hayward-type center than anything Chris Otule ever did. But his priority will be the same: rebound, rebound, rebound. Rebound like he did against Ohio State, rebound like he did in January against Georgetown. In that contest Taylor played 23 minutes, grabbing eight rebounds to go with his 14 points. Taylor was a force around the basket, attempting 14 of his 16 shots at the rim. He made a 15-footer and missed on a 3-pointer from the right corner; other than that it was all around the bucket. True, he went just 5-for-12 on those shots, and he shot just 45 percent on field goal attempts at the rim this past season — that was tied for the worst mark on the team, matching Jake Thomas’ mark, for reference. And he made just 23 percent of his 2-point jumpers, better than only Juan Anderson. Taylor has the look, to be sure, and the potential that made him a three-time state champion and top-100 recruit is still untapped. But to say that Taylor had a good season, even in his limited minutes, would be incorrect. He deserved more minutes (#FreeSteveTaylor), but shooting 32 percent is shooting 32 percent. While he likely never got into the flow of things, his offense is still a negative as a whole; his -0.2 Offensive Win Shares were the worst on the team, as was his 82.7 Offensive Rating. Despite the excellent rebounding numbers, defensive lapses still plagued him at times. Too many times he was caught out of position, lost his man and rarely provided help-side defense; he blocked one shot in 237 minutes, one fewer than Jajuan Johnson recorded in 46 more minutes. Still, there’s room in a Division I rotation for a player as talented as Steve Taylor. His rebounding effort against Ohio State and his personal 8-0 run against Georgetown have proved that. 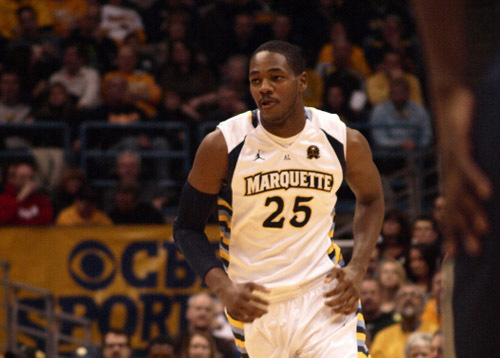 But he must improve on the little things to earn that playing time, something that will be demanded of him as Marquette’s tallest and biggest player to date.